Liverpool has it’s amazing sights, but Darren & Heather chose the perfect day to hold their romantic wedding at 30 James Street. “Home to the Titantic” this Grade II listed building commemorates the RMS Titanic and the White Star Line which has now become a huge part of Liverpool’s maritime history. With it’s restored features and period design this amazing venue provides you with your dream fairytale wedding. The lead upto their big day, Darren & Heather were anxious as well as nervous. They put in months of planning, so when their day arrived, they finally felt relaxed and looked forward to the day ahead. Heather stayed at the hotel, which for her was a great idea, as she enjoyed a full day of pampering and made to feel like royalty. She had her 3 bridesmaids with her who helped her get ready with her friend Jane styling all of the girls hair. Darryl Quinn did all of the girls make-up, who Heather met at another wedding, decided she wanted her for her wedding day and to refresh for the evening make-up. Heather is a Sarah Jessica Parker fan and decided she wanted to say ‘I Do’ in Jimmy Choo shoes and having her headdress as her ‘something borrowed’ from her friend Lucy was a lovely touch too. Darren’s friends from Holland kept him company the morning of the wedding and his brother, the best man delivered a Tag Hauer watch, a gift from Heather, which was a lovely surprise. The men’s outfits were Ted Baker suits as Darren liked the tailored fit and quirky lining. As they didn’t want to take away the grand and ostentatious feel of 30 James Street, they opted for small pieces to dress the room. With a ‘Game of Thrones’ theme they had birdcages as centre pieces and jagermeister as favours. It was Vintage meets Westeros! Which leads me to mentioning their wedding cake… made and designed by a family friend. It was a stunning blush pink birdcage next to 2 books (Game of Thrones volumes 1&2). I asked them what was their most memorable part of their day, they both said, “seeing each other’s faces as Heather walked down the aisle with her Dad was amazing.” Darren said “it was something he will never forget” and it took some effort to remain composed. They also said “we loved having their photographs taken outside in the central reservation with Matthew.” “Being between the hotel and the Liver Building was unforgettable, as many cars were beeping and waving, we loved every minute of it”. They knew Liverpool was the right choice to get married in as there aren’t many cities in the world that do hospitality as good as Liverpool does. In the evening, there was so much love in the room they took a moment to take it all in. Having Small Print a band play for their first dance as well as at their wedding breakfast, was a romantic moment too. Their guests also enjoyed having photos taken in a photo booth by The Big Booth. 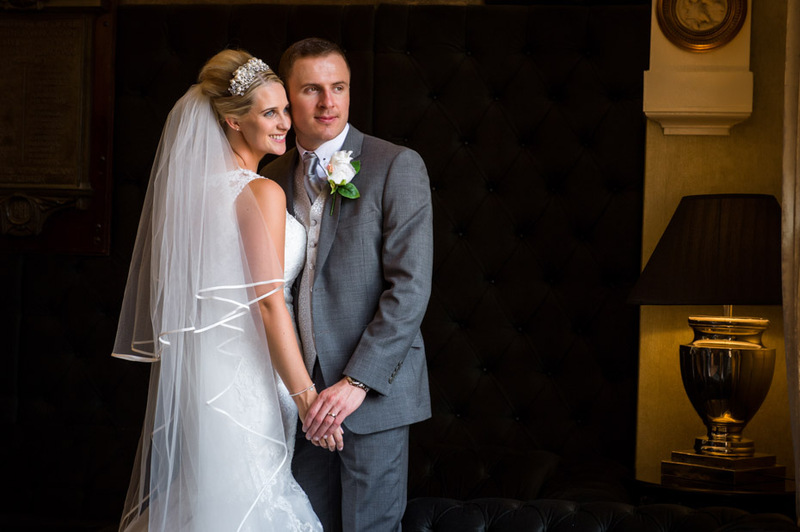 Enjoy some of my favourite wedding photographs of their wedding at at 30 James Street.